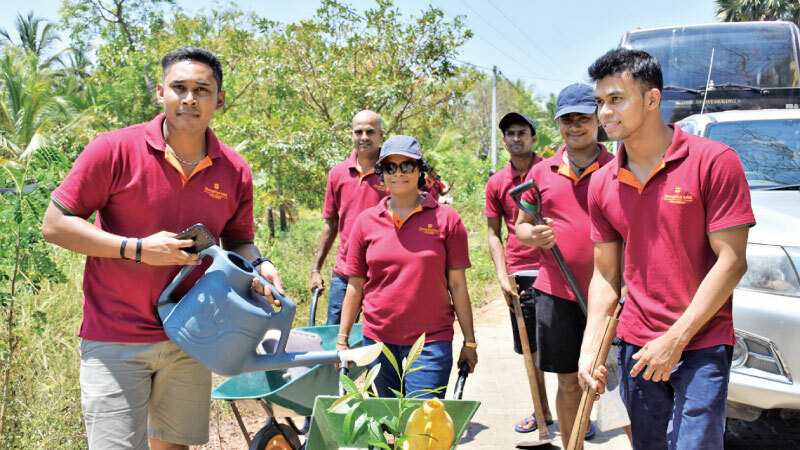 Shangri La Hotel employees during the tree-planting campaign to protect the Mahadhodanaththewa tank in the Madde Ramabawa Cascade. In commemoration of World Water Day 2019, Shangri La Hotel, Colombo partnered with the UNDP to protect the cascades in the North Western Province. By pledging to plant an initial 800 trees to protect the Mahadhodanaththewa tank in the Madde Ramabawa Cascade, both Shangri La and UNDP are working together to realise the vision of a sustainable and climate-resilient Sri Lanka. Sri Lanka’s tanks were built in cascading systems, using the natural inclination and topography of the land, full of small watersheds. The main goal of the system was to save and re-use water, allowing cultivation of rice in the Dry Zone. Today, many of these tanks need to be revitalised. Furthermore, with erratic changes in the climate, shifting from extreme drought to floods, these cascades now need to be upgraded. Despite the importance of these water bodies much of it has been neglected by man. Furthermore, deforestation across the area has also made the area dryer making survival difficult for communities and animals. The Dry Zone is now hotter than ever. Clean water and food are scarce and is often a luxury to the community around. Farmers are struggling to make ends meet with crops dying failing to make yield. Animals are affected too. Elephants are now increasingly making their way towards villages in search of water causing a growing human-elephant conflict. It is in this situation that the Sri Lankan government is implementing the ‘Climate Resilient Integrated Water Management Project’ (CRIWMP) with technical support from the UNDP. This is a seven-year project targetting vulnerable households in three river basins - the Malwathu Oya, Mee Oya, and Yan Oya (rivers) - which flows through the northern part of the Dry Zone. These river basins which are among the most vulnerable to the effects of the climate change, have a high presence of village irrigation systems and cascade systems on which smallholder farming populations depend for their livelihoods – most of whom are women. The area also significantly lacks safe drinking water, which poses a high risk of kidney disease to communities. Further recognising the importance of protecting these water bodies, the project has also started a tree-planting programme with a target of planting one million trees by the end of the project cycle. In the past, tanks in the Dry Zone had well maintained tree girdles or the ‘gasgomman’ along the upper shore lines in them when the tanks are full of water. Today, due to unsustainable human activities, only a few tanks are surrounded by tree girdles which protect the water reserves as a wind barrier to avoid dry wind causing high evaporation traversing over the tank surface. Native plants such as kumbuk, karanda, mee, maila and damba are therefore now being planted around these tanks to protect the water.